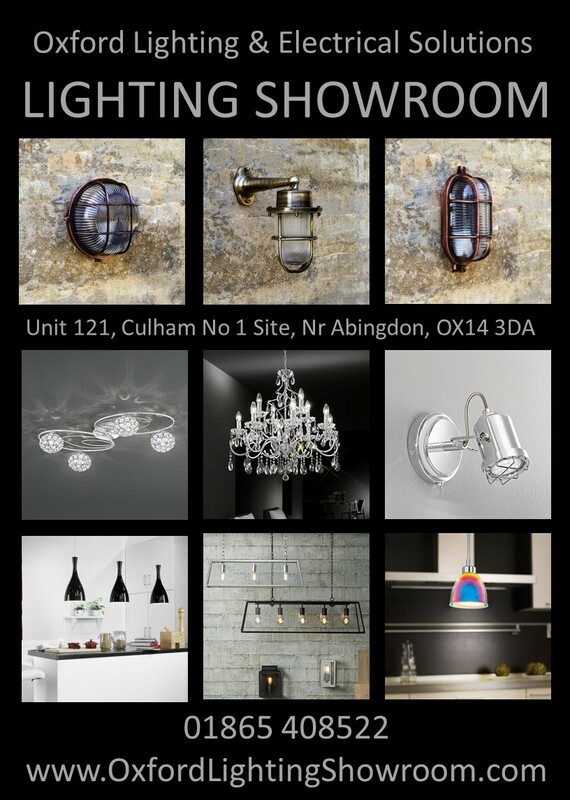 Oxford Lighting & Electrical Solutions – Oxford’s best kept secret for those of you who require lighting. The showroom can be found on the No 1 Site, just past Culham rail station, not far from Abingdon. From the outside, it’s not much to look at (look out for the large ‘Lighting Showroom’ banner, it can be seen from the main road), but when you open the door you step into an Alladin’s Cave full of Lighting! Over 300 lights, including Chandeliers, Pendants, Semi-Flush Ceiling Lights, Spotlights, Track lighting, Exterior Lighting, Table Lamps, Floor Lamps, Wall Lights and more, can be found in this quirky showroom. Not to mention the 10’s of thousands of products available from the catalogues, from the industries best lighting suppliers. Oxford Lighting & Electrical Solutions are approved dealers for Franklite, Astro Lighting, Endon Lighting, Interiors 1900, Dar Lighting, Diyas, Mantra, Elstead Lighting, Impex and many more suppliers of quality lighting and accessories. Oxford Lighting boast quality products, great customer service, and can back it up with extensive knowledge, Peter (The Boss!) is an electrician and has years of experience in lighting as well, if you want to know anything about LED’s, just ask him, its one of his favourite subjects (the other being football, but if you start on that one you could be there all day!). This secret is too good to be kept, spread the word and if you want anything lighting or electrical, get yourself down to the showroom today!